There really is a part of Naples called Arco Felice (Happy Arch!). It's actually part of the town of Pozzuoli and is adjacent to Bacoli along the beach almost to Baia as you approach the western end of the Gulf of Naples along the sea-side. It was, in fact, a port in ancient times, serving Cuma. Currently, the population is about 10,000. Arco Felice is smack in the middle of all the Flegrean lakes of mythology: Fusaro, Averno and Lucrino. The arch spans an artificial gap in Mt. Grillo. That gap was one of those works planned by emperor Domitian in 95 AD as part of general construction of the Via Domiziana road to connect Rome and Naples. Road construction in ancient Rome (and, indeed, in modern Italy) worked on the principle of "Why go around it when you can go through it? Thus, they banged through part of the mountain and built two sturdy cement sustaining walls in order to support the steep sides of the gap. To connect one side with the other, they built a wall lined with brick, with cement supports and with an internal passage and arched vault. The imposing structure is 20 meters high and 6 meters wide. Again, nothing has been found along the arch or in the walls on the hills on either side to indicate that the passage was ever used to convey water. Immediately on the right as you pass the arch there is an entrance to an underground space. There are additional such spaces on the left. The base of the arch still conserves the ancient Roman basalt. Farther into the valley on the left side of the road you can also see the Cuma-side entrance to the Grotto of Cocceius. The arch is no longer really that close to the part of town called Arco Felice; the arch, itself, is best approached from the large via Domiziana highway as it passes by Lake Averno. There is a turn to the left, and you follow signs directing you to Cuma. 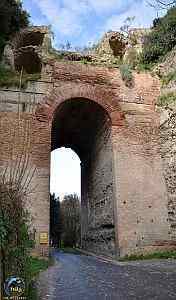 The arch was a portal to Cuma in Roman times; the Romans got to Cuma the same way —leave Naples, go up the Domiziana, hang a left after the lake and go through the arch. Monte Nuovo is the bulge (a volcano!) left of center and above Lake Lucrino, the water in the foreground. (The water on the right is the Bay of Pozzuoli.) The houses on the slopes of Mt. Nuovo are part of the modern town of Arco Felice. The Roman arch is not in this shot; it is well behind the point from which this photo was taken. Photo credit: top photo by Napoli Underground.